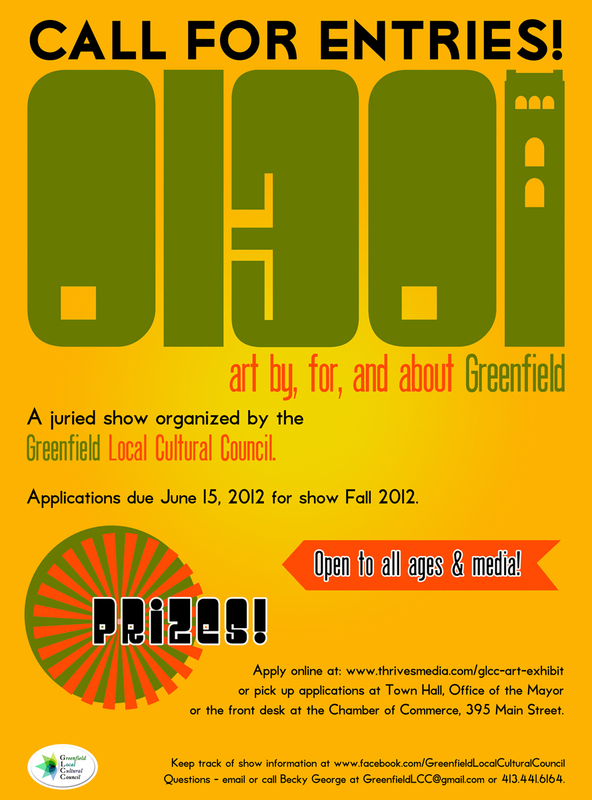 Now accepting applications for the Greenfield Cultural Council’s 2018-2019 cycle. Apply here. 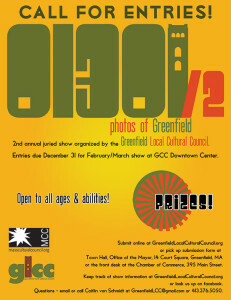 “01301/2: photos of Greenfield” Show Opening February 6! 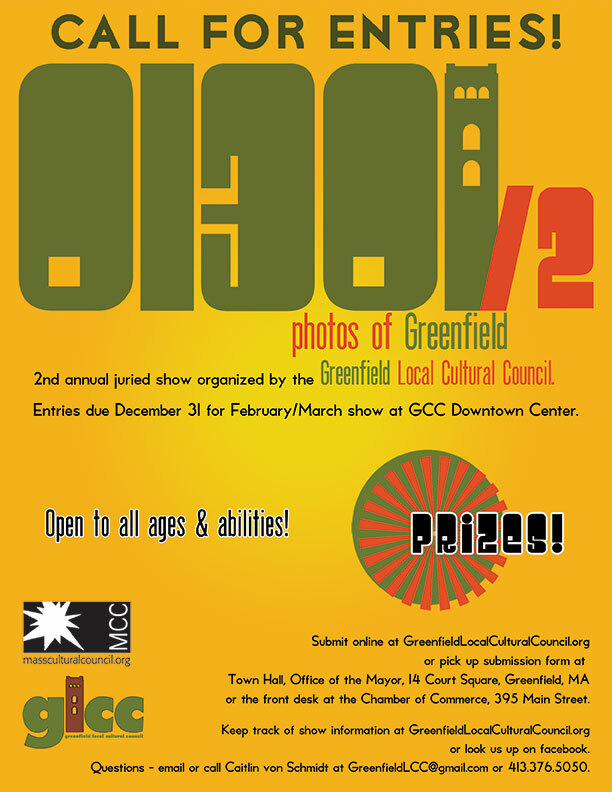 It’s time for the 2nd annual art show sponsored by the Greenfield Local Cultural Council, “01301/2: photos of Greenfield.” This year’s show features photos of Greenfield chosen from submissions to the Master Plan photo contest and those submitted directly to the GLCC. It will run from February 6 through the end of March at the Greenfield Community College Downtown Campus at 270 Main Street. Building hours are Monday – Friday 8 a.m. – 5 p.m. and in the evenings when classes are being held. A four-person jury made up of Braden Chattman, a faculty member at the Hallmark Institute of Photography who was also on last year’s jury; Karen Gaudette, artist, educator, and winner of last year’s show “01301: images by, for, and about Greenfield”; Beth Reynolds, photographer, educator, and owner of base camp photo; and Greenfield Mayor Bill Martin curated the show and chose the three winning images. The show will include an additional gallery of work from local professional photographers who were invited to show by the GLCC. Please join us at the opening on Thursday, February 6 from 5 – 7 p.m. as we celebrate Greenfield as captured through the lens of these talented photographers. Light refreshments will be served; no admission charge. You can see the facebook event page here. 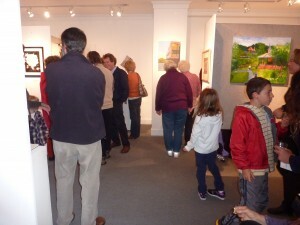 Did you miss tonight’s stellar opening of the “01301” show? Good news! You still have a chance to catch it tomorrow, Saturday October 13, between 10 a.m. & 8 p.m. After that it has to come down so come down to 9 Mill Street to see some great local art! “01301” poster available at opening! 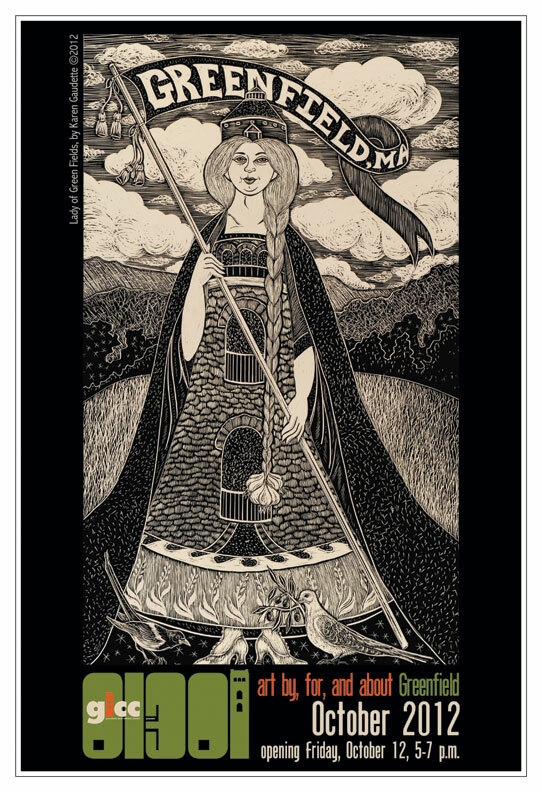 If you love the postcard invitation we did for the “01301” show, featuring Karen Gaudette’s entry “Lady of Green Fields,” great news – we’ll be selling 13″ x 19″ posters of it at the opening for only $10! If you can’t make it to the opening, they’ll be available on our website soon but probably for an itty bit more. Come on down to 9 Mill Street this Friday the 12th from 5-7 for the best deal, some food & drink, & some mighty fine art! 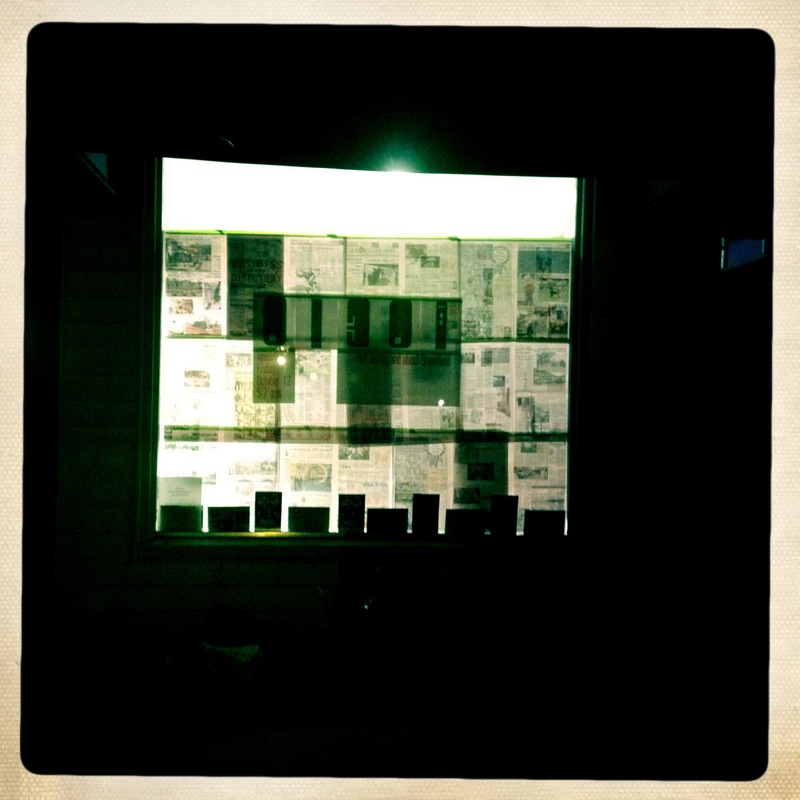 The “01301” opening is this Friday! Please join us at the opening of the GLCC’s first annual juried art show, “01301: art by, for, and about Greenfield,” this Friday, October 12, from 5-7 p.m. at the Mill Street Gallery, 9 Mill Street, Greenfield. Go down Bank Row, take a right, and look for the blue awnings! And while you’re downtown, make sure to check out the Brick+Mortar International Video Art Festival, the Greenfield Poetry & Spoken Word Festival, and the Brass Buckle’s Taco Party featuring Egg, Eggs. And across the the river in Turner’s Falls, Loot’s One Year Anniversary & Art Show. You won’t find a better night to be in downtown Greenfield for some time! The show is going up! 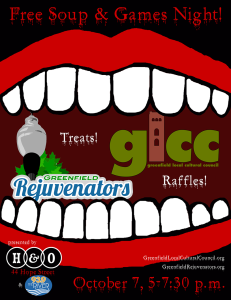 Meet the GLCC at the 3rd Annual Arts Eclective Sept 8! 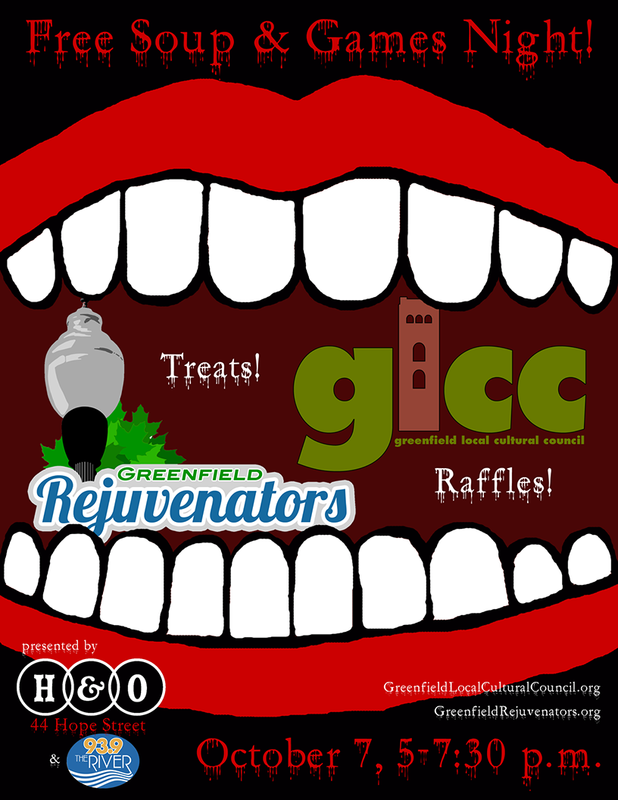 GLCC grant recipient 3rd Annual Greenfield Arts Eclective and Small Press Fair will take place September 8 at Energy Park in Greenfield. The event is free and open to the public; you can read more about it here. 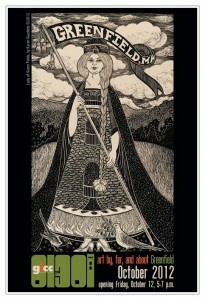 On June 16, the Energy Park: Coop Concerts will be presenting the Green River String Band, Barry Higgins, and Daniel Hales and the Frost Heaves from 6:00 – 8:00 pm. Bring a picnic, and your pals. It’s a gem of a Thursday nite line-up!